Train & ferry on one ticket. You can buy a SailRail ticket from any station in Britain to any station in Ireland. Short notice or busy dates +£5.50 Fast ferry +£5.50. Kids under 5 free, under 16s half price. Fed up with flying? Discover a well-kept secret: You can buy a cheap SailRail ticket between any rail station in Britain & any rail station in Ireland, train & ferry on one ticket. Swap a stressful flight for a relaxed train ride along the beautiful Welsh coast, then by cruise ferry across the Irish Sea. See the journey in pictures below & watch the video. It reduces your CO2 emission by up to 73%. All-weather reliability: Flights can be cancelled due to fog, snow & other bad weather, but Irish Ferries say their rock-steady 50,000 ton ship Ulysses has seldom missed a sailing due to weather. SailRail route map - choose the most suitable route. 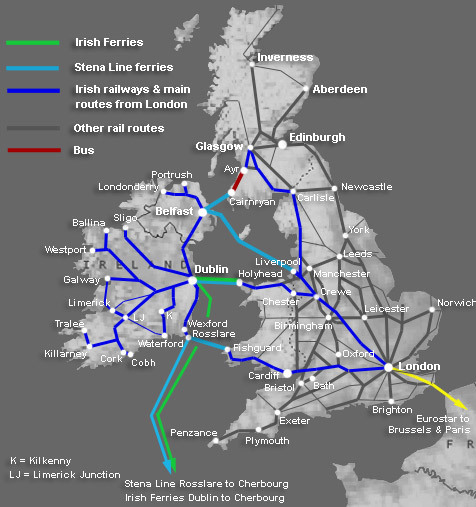 Which train & ferry route to Ireland? If you look at the map below it should be self-explanatory. The route via Holyhead is the traditional route from London to Dublin & most of Ireland including Cork, Limerick, Galway & Sligo. The Fishguard-Rosslare route is good for London to Wexford & Waterford, and also for Bristol or Cardiff to Dublin. However, Rosslare is not well linked to Cork or Limerick so these are best reached via Holyhead & Dublin. You can travel between Scotland & Dublin either via Cairnryan & Belfast, or via Holyhead, it's usually cheaper & easier via Holyhead. For London to Belfast you can go via either Holyhead, Liverpool or Cairnryan, see the Northern Ireland page. If you use the journey planner at www.loco2.com it'll work out the most logical route for your journey. Click here for a detailed map of the UK train network & ferry routes. IR (Iarnrod Eireann), www.irishrail.ie for Irish train times, fares, online tickets. To buy SailRail tickets in Britain use www.loco2.com or call 08709 000 773. To buy SailRail tickets in Ireland, book online here or call 1850 366222. GMT (GMT+1 from last Sunday in March to last Saturday in October). www.ireland.com. Irish tourist board in UK: 020 7518 0800. Let's keep things simple. Here's the service I'd recommend for travel between London or Southeast England and Dublin, Cork, Limerick, Galway, Sligo & most other Irish destinations. It's the cheapest option, with all-weather rock-steady reliability and it's a classic journey with lots to see on the way, see the journey in pictures & video below. It's not the only option - there is an overnight option & other departures using fast ferries, see the complete London-Dublin timetable here. You leave London's Euston station at 09:10 on Mondays-Saturdays by air-conditioned 125mph Virgin Voyager train direct to Holyhead arriving 12:50. On Sundays you leave London at 08:15, change trains at Crewe and arrive Holyhead at 12:43. It's a lovely and historic journey across England and along the North Wales coast onto Anglesey, see the journey in pictures below. For the best views between London & Holyhead, choose a seat on the right-hand side of the train, ignoring your reserved seats if they are on the wrong side. Refreshments are available from the on board shop. Map of London showing Euston station. At Holyhead, the ferry terminal for both Stena Line and Irish Ferries is inside the station at the end of platform 2. Walk straight off the train into the ferry terminal and check in for the ferry at the relevant ferry operator desk. There's a 30 minute check-in for Irish Ferries, 40 minutes for Stena Line. After getting your boarding pass there's a brief and painless X-ray security check, and you then check in your bags so you don't have to carry them round with you on the ferry. 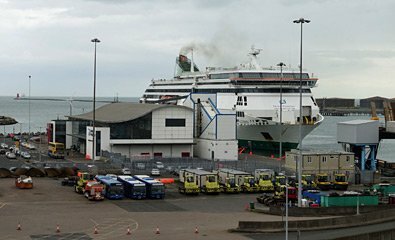 Both Stena Line & Irish Ferries ships berth a little way from the terminal building at Holyhead, so after check-in passengers are shuttled to the ferry by courtesy bus. If you book to Dublin Port Irish Ferries (or to Dublin Ferryport, as different websites use slightly different terms) you sail from Holyhead at 14:10 on Irish Ferries ship Ulysses, arriving Dublin Ferryport at 17:25. If you book to Dublin Port Stena, you sail from Holyhead at 14:00 on Stena Line's Stena Adventurer arriving at Dublin Ferryport at 17:15. Both line's ships are excellent and both sail every day, but in my opinion the superb, huge & rock-steady 50,000 ton Ulysses is the most glamorous & comfortable ship. Whichever company you choose, the ferry has free WiFi, bars, cafes, lounges, a restaurant, cinema, children's play area, fast food outlets, shop & open-air deck. You can pay for a private cabin if you like, with toilet, shower & satellite TV, just ask at the ferry's reception desk. Take a virtual tour of the Ulysses. 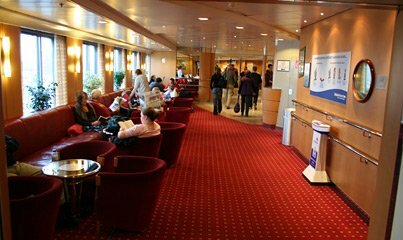 Top tip, upgrade to Club Class on the ferry... For a small extra charge (£16 or €18) paid on board at the entrance, you can use the Ulysses' Martello Club Lounge on deck 11 above the bridge with complimentary red & white wine, tea, coffee, smoked salmon, cheese and biscuits. The lounge gives a superb forward view of the coast of Ireland and the Bay of Dublin approaching. 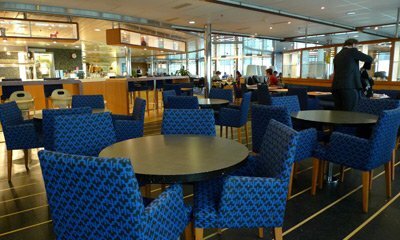 There's a similar lounge on Stena Line called Stena Plus. which also gives a great forward view. If you want privacy, a nap or a shower, you can pay a small charge for a private day cabin with shower & toilet, just ask at the ferry's reception desk. This is the best way to see Ireland for the first time, not from inside an airport! . 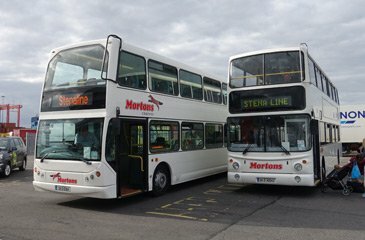 If you arrive on Irish Ferries' Ulysses at 17:25, you'll find a double-decker Morton's bus waiting outside the terminal to take you to the city centre just 2 miles away. It leaves when the foot passengers have left the ship at around 17:35, arriving at Dublin Connolly station (for trains to Wicklow, Wexford, Sligo, Belfast) around 17:50 and Dublin Heuston (for trains to Cork, Limerick, Galway, Tralee) at 18:25. The fare is €3 to Connolly station or €4 to Heuston station, children aged 4-15 half price, under 4 free. The bus accepts pounds as well as euros, but only in notes with change given in euros. If you arrive on the Stena Adventurer at 17:05, a similar double-decker Morton's bus will be waiting outside the terminal to take you to central Dublin at Connolly Station arriving around 17:40 and Heuston station arriving around 18:05. The fare is €3 to Connolly or €4 to Heuston. Children aged 4-15 half price, under 4 free. The bus accepts pounds as well as euros, but only in notes with change given in euros. If you'd prefer a taxi, this costs around €15 from the ferry terminal to Connolly Station or any central Dublin hotel or €17 to Dublin's Heuston station, journey time 25 minutes. You'll find plenty of taxis waiting outside the ferry terminal. 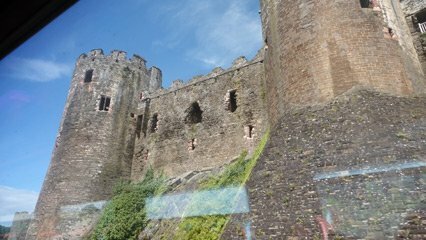 A painless and scenic trip from central London, three countries in one day, England, Wales & Ireland! For Belfast, take the daily 19:00 Enterprise from Dublin Connolly arriving at Belfast Central 21:15. For Sligo, take the daily 19:05 train from Dublin Connolly station arriving Sligo at 22:05. For Cork, take the daily 19:00 train from Dublin Heuston station arriving Cork at 21:58. For Limerick, a train leaves Dublin Heuston station on Mondays-Saturdays at 19:00, change at Limerick Junction, arriving Limerick at 21:28. On Sundays, leave Heuston at 19:05, change at Limerick Junction and arrive Limerick at 21:23. For Galway, leave Dublin Heuston station on Mondays-Saturdays at 19:15 arriving Galway at 21:50. On Sundays, leave Heuston at 18:45 arriving Galway at 21:25. For any other destination in Ireland, use the journey planner at www.irishrail.ie to check train times from Dublin. Make sure you allow enough time to interchange in Dublin. If it's not possible to complete your journey the same day (for example, the last train to Tralee leaves Dublin before you get there), SailRail tickets allow you to stay in Dublin overnight and take a train next day. Map of Dublin showing railway stations & city centre. Step 0, if you're starting your journey in Belfast, Cork, Limerick, Galway, Sligo or anywhere else in Ireland, travel up to Dublin by any evening train and stay the night. 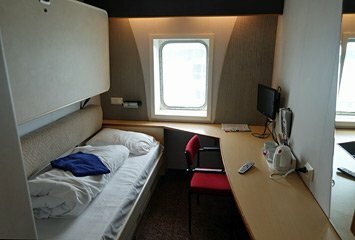 Find hostel or hotel in Dublin. If your train arrives at Heuston station, take the LUAS tram to Connolly station, this runs every 5-10 minutes and takes 15 minutes, fare €1.50 (not included in through tickets). The tram leaves from right outside the front of the station. Map of Dublin showing city centre, railway stations & ferry terminals. Alternatively, a same-day journey is possible from most of Ireland to London if you leave on a morning train to Dublin to connect with the 14:30 Swift from Dublin Ferryport to Holyhead, arriving in London in the evening. Simply use the journey planner at www.loco2.com to find train and ferry times and buy tickets. To connect with the 08:05 Irish Ferries ship Ulysses or the 08:10 Stena Line ship Stena Adventurer, a bus leaves the Morton's bus stop (colour red & white) on Westmoreland Street at 07:15, outside O'Brien's Sandwich Bar opposite the Westin Hotel, fare €3 adult, €1.50 child 4-15, please have exact fare. Or simply take a taxi from central Dublin to Dublin Ferryport, this costs around €15 from any central Dublin hotel to the ferry port & takes about 25 minutes. Map of Dublin showing ferry terminals & city centre. Irish Ferries' luxury superferry Ulysses sails from Dublin Ferryport terminal 1 at 08:05 every day and arrives at Holyhead at 11:30. The Ulysses was until recently the world's largest car ferry, with excellent on board accommodation including bars, restaurant, cinema, children's play area, free WiFi and even private cabin for an extra charge. At Holyhead, a courtesy bus transfers you to the ferry passenger terminal at the station. Stena Line's competing Stena Adventurer sails from Dublin Ferryport terminal 2 at 08:10, arriving in Holyhead at 11:50. The Stena Adventurer also has excellent on board accommodation including bars, restaurant, cinema, children's play area, free WiFi and private cabins for an extra charge. At Holyhead, a courtesy bus drives you off the ferry to the ferry passenger terminal at the station. Step 3, travel from Holyhead to London by train. On Mondays-Fridays, you leave Holyhead at 12:53 on a direct train to London Euston arriving at 16:37. On Saturdays, you leave Holyhead at 12:38, change in Chester (arrive 14:14, depart 14:35) and arrive London Euston at 16:36. On Sundays you leave Holyhead at 12:50 on a direct train to London, arriving London Euston at 16:41. London to Dublin costs just £43.50 if you book by 18:00 the day before travel or £49 if you buy your ticket on the day or when the £43.50 rate sells out or is otherwise not available Bought in Ireland, it's €50. London to Cork, Limerick, Galway, Sligo, Tralee or Killarney costs £65.50 each way if booked by 18:00 the day before travel or £71 if bought on the day or when the £65.50 rate has sold out. London to Belfast costs £58.50 each way if booked by 18:00 the day before travel, £64 on the day or when the £58.50 rate has sold out. Children under 16 travel for half price, under 5's go free, no ticket required just bring them along. You can buy a SailRail ticket from any station in Britain to any station in Ireland. No break of journey is allowed on SailRail tickets, and no further discount with railcards. .see full details of SailRail fares between any British station & any Irish station here. See first class fares here. You can buy one-way or round trip tickets in either direction at www.loco2.com, with no booking fees and no card fees, international credit cards accepted. Start typing 'Dublin' as your destination then select Dublin Ferryport to travel on the Ulysses, or Dublin Port - Stena to travel with Stena Line. You don't have to book way in advance. You can buy these tickets just weeks or days ahead, or even on the day of travel itself. More info. Alternatively, if you have any problems, you can also book at www.trainline.com which accepts all international credit cards, but charges a small booking fee of about £1.50. On the plus side, www.trainline.com can also post tickets to UK addresses for around £2.50 or to any address worldwide for £10. IMPORTANT: Tickets can be collected at any British station including London Euston free of charge, but cannot be collected in Ireland. For one-way journeys starting in Dublin with ticket collection at Dublin port, book with irishferries.com as shown here. Booking tip: In the Dublin to London direction it's almost impossible to book the 08:05 Irish Ferries Ulysses from Dublin using the rail industry booking system. That's because it is overtaken by the faster 08:30 Swift and the booking system therefore ignores the 08:05. The solution is to either switch to Stena Line and book from Dublin Port - Stena to London as a one-way and use the 08:10 Stena Line ship instead of Irish Ferries Ulysses, or to book the 08:05 Dublin to London service as a one-way ticket at www.irishferries.com on their SailRail page - the Irish Ferries website allows you to specifically select the 08:05 Ulysses departure and gives you an open ticket for the train, with tickets collected at the Irish Ferries desk in Dublin. By all means take the faster 08:30 Swift if you like, but remember that the Ulysses is £5.50 cheaper, has more facilities and has all-weather rock-steady all-weather reliability. The Swift is faster but is cancelled as soon as wave height exceeds 1 metre. Full details of fares & how to buy tickets. Buy tickets online starting in Ireland: You can also buy SailRail tickets starting in Ireland from Irish Ferries at www.irishferries.com. Select Dublin Port to London (all stations) or any other British station you like, with an 08:00 departure time. Tickets can be collected at the Irish Ferries desk at Dublin Ferryport or sent to any address in Ireland or worldwide by normal post at your own risk. You can add access to the Martello Lounge or a private day cabin to your booking this way, too. Incidentally, yes the site sells SailRail tickets and yes that includes the UK train, but no, it won't tell you the train times, it just gives ferry times and provides an open ticket for the rail part, you can use any suitable train and sit where you like. Full details of prices & how to buy tickets starting in Ireland. You don't have to start in London, of course! Simply use the journey planner at www.loco2.com to check times & prices & buy SailRail tickets from Manchester, Birmingham, Leeds, Edinburgh, Cambridge, or any railway station in Britain to or from Dublin Ferryport (to travel with Irish Ferries) or Dublin Port - Stena to travel with Stena Line. The concourse at London Euston, waiting to board the train to Holyhead for Dublin. See location map. A green & pleasant land... The train leaves the London suburbs behind and is soon racing through the countryside of Buckinghamshire, Hertfordshire and Northamptonshire at 125 mph. Look out for glimpses of narrow boats on the Grand Union Canal alongside the railway on the right. 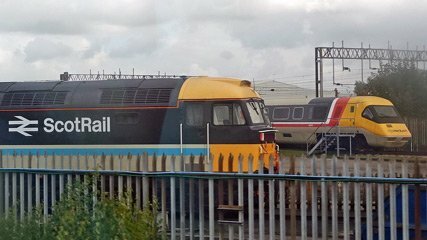 After calling at Crewe, Britain's archetypal railway junction, you pass the Crewe Heritage Centre on the right with preserved prototype APT. 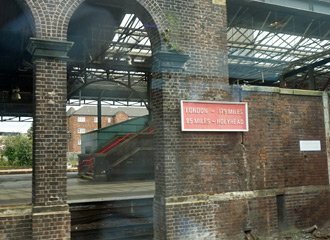 At Chester, look out for the historic sign, "London 179 miles - Holyhead 85 miles..."
Immediately after the tubular bridge the train passes under the imposing battlements of Conwy Castle, on the right hand side. Have your camera ready! 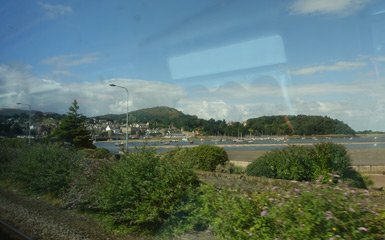 The train now crosses the Menai Strait onto the Isle of Anglesey, over Robert Stephenson's celebrated Britannia Bridge, built in 1850. Originally rail-only and originally boxed-in, it was rebuilt after a fire in 1970 and you can now see out of the sides. Only the piers are original and it now carries a road above the railway. As you cross the Britannia Bridge you'll see Telford's beautiful suspension bridge built in 1822-1826 (pictured above) a little way along the Menai Strait to your right. Blink and you miss it... 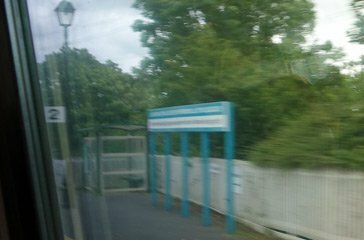 The train passes non-stop through Llanfairpwllgwyngyllgogerychwyrndrobwllllantysiliogogogoch, the station with the longest name in Britain and now a visitor attraction in its own right. Soon afterwards the train arrives in Holyhead, just 3h40 from central London. Welcome to Holyhead, where trains meet ferries. The ferry check-in is inside the station at the end of platform 2. Check in at the relevant ferry operator's desk. You check in your bags, then a courtesy bus shuttles you to the ship. The Ulysses is one of my favourite ships, and a crossing on her is a real treat. At 50,000 tons, the Ulysses was the biggest ferry serving the British Isles until Stena Line's 63,000 ton Stena Hollandica & Stena Britannica entered service on the Harwich-Hoek van Holland route. She's rock steady under most conditions, and in ten years of service she has hardly ever missed a sailing due to weather - more than can be said for the planes! You check in your bags at Holyhead so you don't have to carry them round on the ferry. She has free WiFi, too. Take a virtual tour of the Ulysses. Passengers walk off the Ulysses via the passenger gangway. Although she arrives 20 minutes after the Stena Adventurer, disembarkation is much quicker. Also a great ship, also with free WiFi and with its own premium lounge called Stena Plus. As with Irish Ferries, you check in your bags at Holyhead so you don't have to carry them around on the ferry. Take a virtual tour of the Stena Adventurer. The Stena Adventurer sails first, 20 minutes before the Ulysses. This photo was taken from the deck of the Ulysses. A courtesy bus drives foot passengers off the ferry's car deck the 200 yards to the passenger terminal. This video shows how easy the London to Dublin train & ferry journey is, and what there is to see on the way. 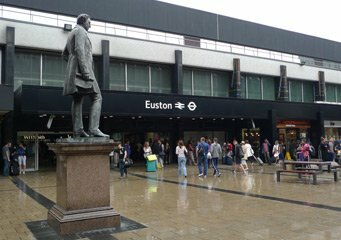 As you enter Euston Station, pay your respects to the statue of Robert Stephenson (1803-1859), the engineer who built the railway to Holyhead including the Britannia Bridge, it's been the civilised way to Dublin since 1850. Also see this Irish Ferries video & virtual tour of the Ulysses. Take a train to Holyhead, then two different ferry operators sail from Holyhead to Dublin, Irish Ferries & Stena Line. Stena Line or Irish Ferries? Both are great companies, and fares are virtually the same, simply book to Dublin Port Stena for Stena Line or to Dublin Port (Irish Ferries) for Irish Ferries. Through tickets to Galway, Cork, Limerick & so on are usually routed via Stena Line by default, but you can change this when using www.loco2.com by clicking More options and entering Dublin Ferryport as a via station. I think the huge 50,000 ton Ulysses is the more glamorous ship, indeed she's a personal favourite of mine, but I like the Stena Adventurer too. Why not go out with one and back with the other? Ship or fast ferry? Remember that the ships have much more extensive facilities and all-weather reliability, and they're rock-steady. The lightweight Swift is an hour faster but bumps about a bit and is cancelled when wave height exceeds 1 metre, with passengers transferred onto the next sailing of the Ulysses. Bear this in mind when travelling in winter, or with an appointment to keep. 1. Irish Ferries ship Ulysses... A luxurious cruise ferry from Holyhead to Dublin port. Reliable all year, all weathers. Free WiFi, bars, restaurants, cinema, optional private cabins. Access to the club lounge costs an extra £16 or €18. 2. Irish Ferries fast ferry Swift... A fast SeaCat from Holyhead to Dublin with reclining seats, club class seats & cafe. Cancelled when wave height >1 metre with passengers transferred to the Ulysses. Tickets cost £5.50 more via the Swift. 3. Stena Line ship... The Stena Adventurer & Stena Superfast X are large and comfortable ferries. Free WiFi, bar, restaurant, cinema, shop, optional private cabins. 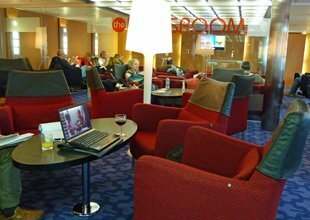 The Stena Plus Lounge costs an extra £18, paid on board. * = The Swift fast ferry now only operates in spring & summer, 14 March to 30 September 2019. ** = On Saturday mornings you leave Holyhead 04:25, change Chester, arrive London 09:29. Or take the direct train leaving Holyhead 06:52, London 10:38. Always check times at www.nationalrail.co.uk or www.loco2.com, especially at weekends as times can vary due to engineering work. You can check ferry times at www.stenaline.co.uk or www.irishferries.com. Direct = This train is a direct 125mph Virgin Trains Voyager or Pendolino train between London & Holyhead. Crewe = You must change trains at Crewe. Birmingham = You must change trains at Birmingham New Street. - = there is no train connection available for this ferry. At Holyhead the ferry terminal for both Stena Line & Irish Ferries is right next to the station at the end of platform 2. 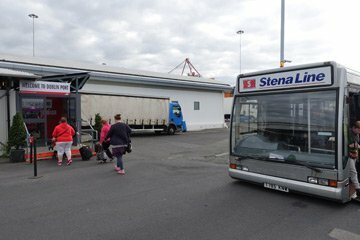 After checking in, passengers for the Ulysses and Stena Adventurer are transferred by free courtesy bus across the port area to the ferry, as the ships berth a little way from the terminal. There is a 30 minute check-in for Irish Ferries or 40 minutes for Stena Line, and your bags are checked in for the crossing. A left luggage office is available at Holyhead, and the town centre is just 5 minutes walk across a footbridge if you have time for a wander. 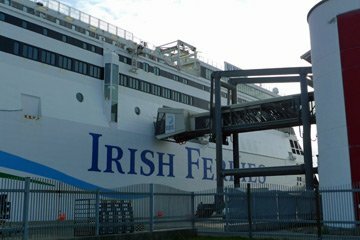 Dublin Ferryport is 2 miles from Dublin city centre. Transfer buses meet all Irish Ferries arrivals and take passengers to Connolly station (for trains to Sligo, Wicklow, Wexford, Belfast), Westmoreland Street then Heuston station (for trains to Cork, Limerick, Galway, Waterford). The bus costs €3 to Connolly station or Westmoreland Street, €4 to Heuston station, children half price, you simply pay the driver on the bus. Please have the exact fare. Buses also operate from the Mortons Coaches stop in Westmoreland Street to meet Irish Ferries departures, you'll find the bus times at www.irishferries.com. Buses also connect with Stena Line arrivals and departures, charging similar prices. A taxi from Dublin port to central Dublin will cost €15 to most central area hotels or Dublin Connolly station, about €17 to Dublin Heuston station, journey time about 25 minutes. Map of Dublin showing ferry terminals, railway stations & city centre. Map of London showing Euston station. Use the journey planner on www.loco2.com to check train times & buy SailRail tickets from any station in Britain to Dublin. Enter 'Dublin Ferryport' or 'Dublin Port - Stena' in the 'To' box depending whether you want to travel with Irish Ferries (Ulysses or Swift fast ferry) or Stena Line ship. Enter your dates of travel and click 'Find trains'. When the results appear, it doesn't distinguish between the Ulysses ship and the Swift fast ferry to Dublin Ferryport, it just says 'ferry'. With 'Dublin Port (Irish Ferries)' selected, if the ferry takes 3 hours or more than it's the Ulysses, if it takes 2 hours or less it's the Swift. With Dublin Port (Stena) selected, it will be the Stena Line ship. Click 'fares' to see the fare for that journey. You can buy a SailRail ticket from any station in Britain to any station in Ireland, routed via Holyhead and either Stena Line or Irish Ferries. This covers both the train and the ferry and any onward Irish train too, all on one ticket for one inclusive price. To check the price from any given station in Britain to Dublin or elsewhere in Ireland, look up which UK zone that station falls into using the zone table, then use the fares tables below. All these fares are one way, returns are twice the one-way fare. Booking usually usually opens 9-12 weeks ahead. Advance fare = SailRail Advance, limited availability, must be booked before 18:00 on the day before travel. When the SailRail Advance fare sells out you pay the SailRail Single fare instead. Advance fares include a reservation on the ferry and on those trains on the British part of your journey on which seat reservation is possible. You can only travel on the specific trains which have been reserved for you, not on earlier, later or alternative trains, unless a delayed train or ferry means you miss a connection. No stopovers allowed. On local or suburban trains where seat reservation isn't possible you can take any suitable train. Tickets are non-refundable, but changes to date or time can be made for a fee (about £10) in person at British railway stations but not in Ireland or by phone. Single fare = SailRail Single, this what you pay if you buy a ticket on the day of travel or when the SailRail Advance fare has sold out. Also known as Standby or Walk-up. A reservation is required on the ferry, but seat reservation on trains is optional and you can use any train and any permitted rail route to and from the ferry port. However, no stopovers are allowed except as necessary to make connections. You can buy a Single fare in advance if you like, but it's only valid on the date you book it for, and the only reason you'd want one if the cheaper Advance fare is available is if you wanted the flexibility to take alternative trains or routes on the way to or from the ferry port from those that the system offers you. Refunds are allowed, minus a £15-£20 admin fee. What do SailRail fares cover? SailRail fares cover the train to Holyhead and the ferry to Ireland, all on one ticket for one inclusive price. Tickets to Irish destinations beyond Dublin also cover the Irish train. Making a return journey? There are no return fares, only one-way fares, so a return journey = two one-way fares. If you're not sure when you will return, I recommend only buying your outward ticket, then buying a ticket back from Dublin online at www.irishferries.com when you know the date, collecting this ticket at Dublin Port. Children: Children under 5 go free, children under 16 go for half the prices shown above. No railcard discounts. Children under 16 must be accompanied by an adult. Unaccompanied children 16-17 years old must have written authority to travel from their parent or guardian. Children under 5 go free, but they need a reservation for the ferry. Does the price vary? Can tickets sell out? Booking opens between 9 & 12 weeks in advance. There are two price levels, SailRail Advance (London-Dublin £43.50 by train & ship, £49 by train & fast ferry) and SailRail Single (London-Dublin £49 by train & ship, £54.50 by train & fast ferry). The Single price is always available even on the day of travel (assuming the quota of ferry places placed on the rail industry reservation system hasn't run out), the SailRail Advance price is usually available if you book in advance, although it's sometimes sold out or unavailable so only the SailRail Single price appears. Note that in practice the rail industry reservation system has a limited quota of ferry places allocated to it, which can sell out at busy times such as around Christmas or Easter, even at the SailRail Single fare, so advance booking is a good idea. Cost of SailRail tickets if bought in euros in Ireland. Railcard discounts: As they are so cheap anyway, there is no Railcard discount on SailRail fares. 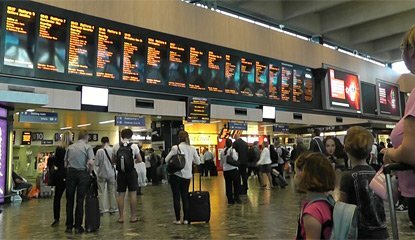 Stopovers: Stopovers at stations in Britain are not allowed using any SailRail ticket, other than to make connections. If you want to stop off anywhere, you'll need to buy separate tickets. 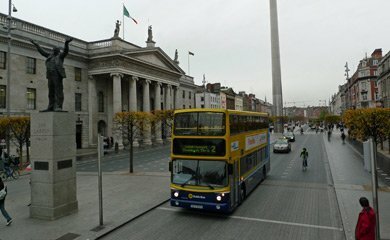 Buses to Dublin city centre: The transfer bus from Dublin Ferryport costs €3 to Connolly station or Westmoreland Street, €4 to Heuston station, children aged 4-15 half price, under 4 free, which you simply pay on board the bus. Better value than flying: When comparing with the cost of a flight, remember that it will cost around £19 one-way or £32 return just for the train ride from central London to or from Heathrow, Luton, Stansted or Gatwick airports, in addition to the air fare. And remember the airline baggage fees, check-in fees, and so on... And these SailRail fares are available at short notice and peak times, too, when flights are expensive! First class travel... There are no first class SailRail fares, but if you want first class comfort on your journey to Ireland it's easy to buy an advance-purchase train ticket between London & Holyhead and a separate ferry ticket to Dublin, see the London to Dublin first class section below. You can check fares to Dublin & Ireland using the journey planner at www.loco2.com. Other Irish destinations: Ireland's rail stations are zoned 1-3, with Cork, Limerick, Galway and Sligo all in zone 3, at the prices shown above. Fares to (say) Wicklow or Athlone will be more than to Dublin, less than to Cork. Are there any baggage limits or baggage fees? Do I check my bags in? 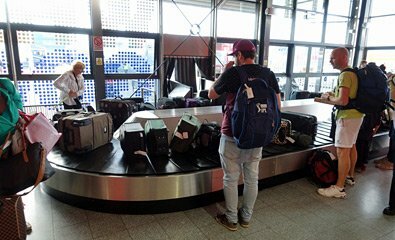 Are there left luggage lockers? There are no baggage weight limits or baggage fees to worry about, as long as you don't take the Mickey. You simply take your bags with you on the train, placing them on the luggage racks above your head or at the end of the coach. You check bags in at the ferry terminal so you're free to use the ferry's facilities without being encumbered with luggage, then you collect your bags again from the carousel at the ferry terminal on the other side of the water. There are left luggage lockers at London Euston (see here for details), at Holyhead and at Dublin Heuston station, but not at Dublin Connolly. Is the ferry affected by bad weather? Can it get rough? I have always found the huge 50,000 ton Ulysses to be rock steady under most conditions, even in the depths of winter. And in ten years of service she has seldom missed a sailing due to weather - or for that matter, volcanic ash, which is more than can be said for the planes. The Ulysses almost always gets through! If you use the smaller, faster Swift SeaCat, this can be cancelled if the weather is poor, especially in winter, when perhaps 5% of sailings are cancelled. If it's cancelled you'll simply be transferred to the next sailing of the Ulysses (if you turn up early for the 08:30 Swift, then if you find it's cancelled, you may get onto the 08:05 sailing of the all-weather Ulysses). Can I take my bike? Yes. Bicycles go for £9 each way on Irish Ferries, £10 on Stena Line. Pre-booking is recommended for Irish Ferries, email them at info@irishferries.com for details. Bikes are carried free on trains to Holyhead, but a bike reservation is compulsory on Virgin Trains as there's a 3-bike limit and recommended for Arriva Trains Wales who have a 2-bike limit. Can I take my dog or cat? Dogs go free on British & Irish trains. For the ferry part of the journey, Stena Line & Irish Ferries allow foot passengers to take small dogs or cats if they're in a container which you can carry onto the ferry. The dogs or cats must travel in their container on the car deck or in the kennel area, see www.irishferries.com or www.stenaline.co.uk/faqs for details. On Stena Line, you can also bring a larger dog not in a container, placing your dog in a kennel on the car deck - this is free on the Holyhead-Dublin route, but best to call Stena to check there's a kennel free first. Guide dogs can be taken into the passengers areas, other dogs cannot. Can I stop off? You aren't allowed to break your journey (in other words, stop off) with a SailRail ticket, other than to make connections between trains or train and ferry. So if you want to stop off at 'X', you'll need to buy buy a regular ticket from London to 'X' using www.loco2.com or (say) www.virgintrains.co.uk, then a SailRail ticket from 'X' to Dublin using www.loco2.com. Do you need to book way in advance? No! You do not need to book months & months in advance. You can buy SailRail tickets just a few days ahead and still find these great fares available. The slightly cheaper SailRail Advance fares can sell out, but you can usually buy SailRail Single fares even on the day of travel. But don't leave it until the last minute if you don't have to. There are a finite number of passenger places on each ferry, and a finite number of those places are allocated to the rail industry ticketing system so that train operator websites & stations can sell SailRail tickets. Most of the time there are enough ferry places for everyone even if you buy on the day of travel, but the rail industry allocation of ferry passenger places sometimes runs out on the busiest dates in July & August, Easter or Christmas if you leave it too close to departure date. How to buy SailRail tickets in Britain: www.loco2.com. If you buy SailRail tickets online at www.loco2.com you can collect them from the ticket machines installed at all main British stations. These are the machines at London Euston station. The original credit card is needed to collect your ticket. You can buy tickets at www.loco2.com, international credit cards accepted. Just use the journey planner on their home page to book from any station in Britain to any station in Ireland, one-way or round trip in either direction. You collect tickets from the self-service machines at any main British station. If you have any problems you can also book at www.trainline.com which accepts international credit cards but there's a small booking fee of about £1.50. On the plus side www.trainline.com can send tickets to UK addresses for around £2.50 or to any address worldwide for around £10, as well as collection for free from British stations. If you're going to or from Dublin, start typing 'Dublin...' as your origin or destination then select Dublin Ferryport for journeys via Irish Ferries ship Ulysses or Swift fast ferry, or select Dublin Port - Stena for journeys via a Stena Line ship. 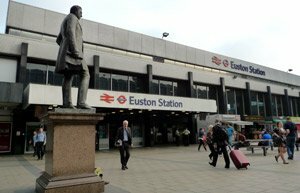 Tickets can be collected at any British station including London Euston free of charge. Tickets cannot be collected in Ireland, so do not buy from Loco2 if you are unable to get to a British station to collect your tickets before you travel. To collect tickets in Dublin, book at the Irish Ferries website as shown below. Workaround for booking the recommended 08:05 Ulysses from Dublin back to Britain: You will probably only see the 08:30 Swift fast ferry from Dublin to Britain because it overtakes the slower 08:05 ship Ulysses and the system ignores the overtaken departure. By all means take the 08:30 Swift if you like, but the Ulysses is £5.20 cheaper, has more facilities and all-weather reliability. The Swift is faster but it's cancelled when wave height exceeds 1 metre, a regular occurrence in winter. If you want the recommended 08:05 ship Ulysses, simply book one-way from Dublin to Britain at www.irishferries.com instead, selecting the 08:05 Ulysses sailing from Dublin (and why not add the Martello Club lounge while you're about it?) and selecting ticket collection from the Irish Ferries desk at Dublin Port. This books you on that specific 08:05 ferry and gives you an open ticket for the UK rail part of the journey which is valid on any suitable connecting train - you'll need to look up train times yourself, or see the times quoted on this page. Or use Stena Line instead by booking a one-way from Dublin Port - Stena to your British destination, there is no such problem booking the 08:10 Stena Line departure from Dublin. Indeed, trying Irish Ferries out and Stena Line back makes an interesting comparison, see which you like best! Tip 1, the system normally routes you via Stena Line by default, which is fine. But to travel via Irish Ferries superb ship Ulysses instead, click More options and enter Dublin Ferryport as a via station. It'll now route you via Irish Ferries. 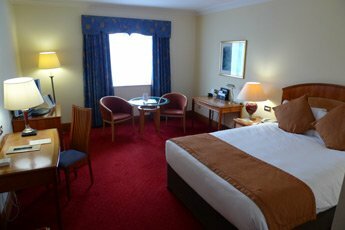 Tip 2, there are times when it's better to split the booking, for example if you want an overnight stop in Dublin. You can book a SailRail ticket between London & Dublin using the booking form above, then add a separate ticket between Dublin and Cork, Limerick, Galway and so on using www.irishrail.ie. Indeed, with advance-purchase web fares from just €10, this can actually be slightly cheaper, although less flexible, and in the westbound direction a missed train means you'd have to buy another ticket. Tip 3, there's an occasional problem booking beyond Dublin: Sometimes Arriva Trains Wales (the UK train company which manages SailRail on behalf of all UK National Rail operators) is late entering Irish train times into the British National Rail ticketing system. Websites such as Loco2.com then find no trains beyond Dublin, so can't sell tickets beyond Dublin. In which case, simply book to Dublin and add a separate onward Irish train ticket at www.irishrail.ie, or perhaps just wait a bit to see if data is eventually loaded and tickets become bookable. Or use www.stenaline.co.uk: You can buy tickets to Dublin from London, Birmingham, Manchester or Liverpool online at the Stena Line website www.stenaline.co.uk. However, Stena Line can only send tickets to UK addresses, they can't be collected at stations or sent to Ireland, and only a few cities are covered, not any station in Britain. Buy SailRail tickets by phone: You can buy tickets by phone from the SailRail booking line, 08709 000 773 (UK callers only). Lines are open 08:00-20:00 Mondays-Fridays, 09:00-17:00 Saturdays & Sundays. Remember to ask for tickets routed either Stena Line or Irish Ferries depending on which service you want in which direction. You can also buy tickets via Stena Line from Stena themselves, 08445 762 762. Buy SailRail tickets in person: You can buy these train+ferry SailRail tickets at most main British railway stations, even on the day of travel. This includes London Euston. But allow plenty of time to buy your ticket, and be aware that small stations (ones without the capability to do seat reservations) may not sell these tickets. It's better to buy tickets a day or two before if you can. How to buy SailRail tickets in Ireland: www.irishferries.com. 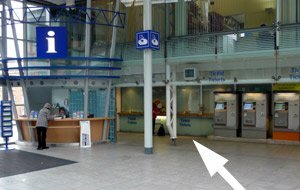 You can buy train & ferry tickets to London or anywhere in Britain in person from the ticket office at Dublin Connolly station indicated by the arrow in the picture above, open for SailRail tickets 09:45-12:30 & 14:30-16:30 Mon-Sat, 11:30-15:30 Sundays & holidays. You can buy SailRail tickets online at www.irishferries.com: Irish Ferries offer online booking for one-way or return SailRail tickets starting in Ireland, from any rail station in Ireland to any rail station in Britain via Holyhead - but read the paragraph below first! Tickets can be collected at the Irish Ferries desk at Dublin Port, useful if you're from overseas. Tickets can be sent by registered post to Irish addresses. Tickets can be sent to any address worldwide by normal post at your own risk. Tips for using www.irishferries.com: For travel to London, select London (all stations). The departure & arrival times it gives you are for the ferry between Dublin & Holyhead, not for your whole journey, as the system doesn't know any UK train times, just Irish Ferries ferry times. So you'll need to look up connecting train times separately, either by looking at the Dublin-London timetables on this page, or by looking up Irish trains at www.irishrail.ie and British trains at www.nationalrail.co.uk. But YES, SailRail tickets do include the UK train, tickets are valid on any suitable connecting train without restriction. Remember to allow at least 40 minutes check-in for the ferry at Dublin port outward and at Holyhead on the return, plus plenty of time for transfers between Dublin port and Dublin's Connolly or Heuston stations. Obviously, this system will only book SailRail via Irish Ferries to Holyhead, not journeys via Stena Line. Top tip: It's well worth the extra €18 to upgrade to Club Class with a special lounge, complimentary tea, coffee, red & white wine and canapés! You can do this online when you book, or pay the extra on board the ferry. Alternatively, buy from Loco2: You can buy tickets online at the UK prices at www.loco2.com, but tickets must be collected at a British station before you travel. They cannot be posted, printed or collected in Ireland. Buy SailRail tickets in person at Dublin Connolly station at the main ticket window, which sells SailRail tickets 09:45-12:30 & 14:30-16:30 Mon-Sat, 11:30-15:30 Sundays & holidays (see photo on the right) or at these Irish Rail stations: Athlone, Ballina, Claremorris, Dublin Connolly, Dundalk, Drogheda, Ennis, Galway, Longford, Mallow, Cork, Tralee, Killarney, Waterford, Limerick, Limerick Junction, Sligo, Thurles, Tullamore, Westport. They can sell train & ferry SailRail tickets from any Irish station to any British station. SailRail tickets now cost €6 more if bought on the day of travel. Buy SailRail tickets by phone: Call Irish Railways on 1850 366222 (lines open 09:00-17:00 Monday-Friday) (from outside Ireland call 00 353 1850 366222) or call Irish Ferries on 0818 300 400 (lines open 09:00-19:00 Mondays-Fridays, 09:00-16:00 Saturdays, if calling from Northern Ireland or anywhere outside the Republic of Ireland, dial +353 818 300 400) or call Stena Line on (01) 204 7777. Buy ticket by e-mail: to Irish Rail via sailrail@irishrail.ie or to Irish Ferries at sailrail@irishferries.com. 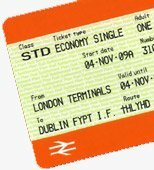 Cost of SailRail tickets bought in Ireland: Bought at least one day before travel, Dublin to London costs €50 (ship) or €56 (Swift fast ferry), Dublin to Birmingham or Leeds costs €45 (ship) or €51 (Swift fast ferry), Dublin to Liverpool or Manchester costs €44 (ship) or €50 (Swift fast ferry). Cork, Limerick or Galway to London costs €70 by ship or €76 by Swift fast ferry. Tickets bought on the day of travel will cost €6 more. Fares in euros for tickets bought in Ireland can be found using the journey planner at www.irishferries.com. Note that tickets bought in Ireland are all of the walk up type, a reservation is needed (and included) on the ferry, but no seat reservation is required on British trains, you can take any suitable connecting train you like once in Britain, although no stopovers are allowed. If your journey starts in Britain, simply buy a one-way or return ticket from London or any rail station in Britain to Dublin or any rail station in Ireland at www.loco2.com. Overseas credit cards are accepted. 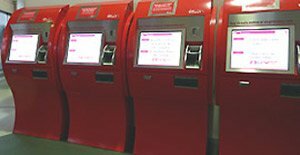 You collect tickets from the self-service ticket machines located at most major British stations, including London Euston, but not in Dublin, which is of course not a British station (do I really have to spell that out?!). If you have any problems buying tickets online, you can simply wait till you get to the UK and buy your ticket at the station. Remember, SailRail fares are fixed-price so there's no need to book way ahead to get the cheap fare, although there's a finite allocation of ferry places held on the rail industry reservation system which can in theory run out, so it's better to book them in advance, at least a day or two beforehand, not five minutes before the train leaves! If your journey starts in Ireland, buy tickets online at www.irishferries.com (but read the booking tips here first!). Tickets can be collected at the Irish Ferries desk at Dublin Ferryport, or posted to any address worldwide by normal unregistered post, at your own risk. 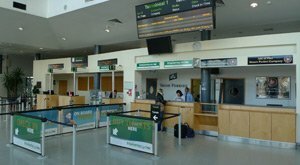 Alternatively, you can wait till you get to Ireland and simply buy a SailRail ticket from Dublin to London at the ticket office at Dublin's Connolly station, see the photo above. SailRail fares are fixed-price so there's no need to book way ahead to get the best fare, it's the same price even bought on the day of departure. However, there's a finite allocation of ferry places loaded onto the rail industry reservation system which can in theory run out, so it's better to book tickets in advance, or at least a day or two beforehand, not five minutes before the train leaves! London to Dublin in first class: "Ryanair eat my shorts..."
A first class table for two on a Virgin Trains Pendolino. 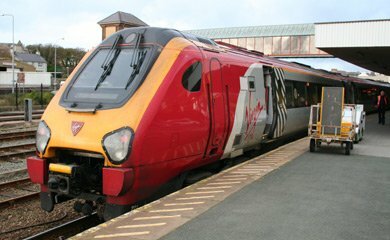 Book a first class ticket to Holyhead on the 09:10 at www.virgintrains.co.uk. Book the 14:10 ferry from Holyhead to Dublin with Club lounge included at www.irishferries.com. There are no 1st class SailRail tickets, but you can easily book a first class journey from London to Dublin using separate train and ferry tickets bought direct from Virgin Trains and Irish ferries. London to Dublin starts at around £165 one-way in first class comfort, with a complimentary cooked breakfast served at your seat on the morning Virgin Train to Holyhead and a seat in the Martello Club lounge on the cruise ferry Ulysses with complimentary red or white wine and canapés, with great views of the coast or Ireland slowly approaching. Step 1, travel first class on Virgin Trains from London to Holyhead, leaving London Euston at 09:10 Monday-Saturday, arriving Holyhead 12:50. 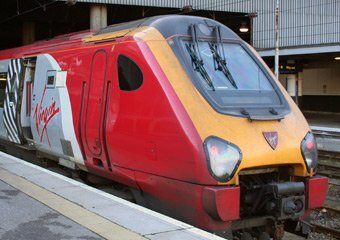 This is a modern air-conditioned 125 mph Virgin Voyager train. In first class you can select an intimate table for two with two armchairs facing each other across a table with table lamp. Or choose a solo seat or table for four. 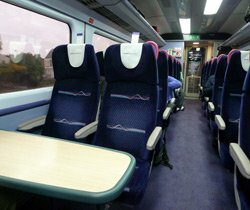 In first class it's quiet, civilised and relaxed - Whenever I've travelled, the first class on this train has been virtually empty, you may have it to yourselves! On weekdays a complimentary cooked breakfast is served at your seat by the steward or stewardess, perhaps egg, bacon and sausage or scrambled egg and smoked salmon. There's cereal or even porridge, and toast. Step 2, sail from Holyhead to Dublin by luxury superferry, leaving Holyhead at 14:10 daily on Irish Ferries cruise ferry Ulysses across the Irish Sea, arriving Dublin Ferryport at 17:25. 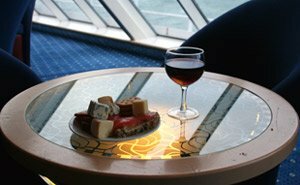 In the ferry's quiet and relaxed Martello Club lounge located over the ship's bridge, you get a fantastic forward view of the coast of Ireland approaching, while you enjoy complimentary red or white wine, tea, coffee, juice, and canapés of smoke salmon or cheese and biscuits. There's also free WiFi. Or you can book a private cabin with beds, shower and toilet. Transfer from Dublin Ferryport to your Dublin hotel by taxi, this costs around €15. Transfer from your hotel to Dublin Ferryport Terminal 1 by taxi, this costs around €15. Remember to allow for the check-in for the ferry. Sail from Dublin Ferryport to Holyhead on Irish Ferries luxurious superferry Ulysses, leaving Dublin Ferryport terminal 1 daily at 08:05 and arriving Holyhead at 11:30. The Ulysses is the world's largest car ferry. In the quiet and relaxed Martello Club lounge located over the top of the ship's bridge, you get a fantastic forward view of the Welsh coast approaching, while you enjoy the complimentary red or white wine, tea, coffee, juice, and canapés of smoke salmon or cheese and biscuits. There's also free WiFi. Or you can book a private cabin with beds, shower and toilet. 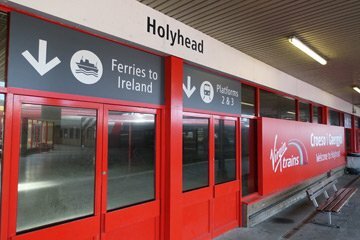 At Holyhead, a courtesy bus transfers you to the passenger terminal and station. Travel by train from Holyhead to London. Complimentary snacks and wine are served in Virgin Trains first class. On Mondays-Fridays, a direct train leaves Holyhead at 13:58 arriving London Euston at 17:38 (there's in fact an earlier connection, but with a change). On Saturdays, you leave Holyhead at 12:38, change in Chester (arrive 14:14, depart 14:35) and arrive London Euston at 16:38. On Sundays you leave Holyhead at 12:50 on a direct train to London, arriving London Euston at 16:44. London to Holyhead first class in theory starts at just £58 if you book in advance. However, in reality the cheapest first class Advance fare I have yet found for the 09:10 departure connecting with the ferry is £120, so in fairness I'm taking that as my 'from' price. 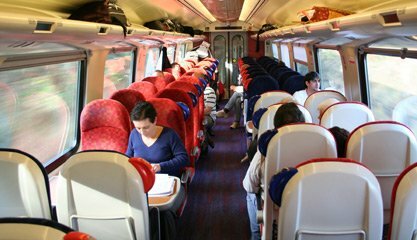 At weekends it's often cheaper to buy a standard class off-peak ticket from London to Holyhead for £85 at www.virgintrains.co.uk, then upgrade to first class for £15, paid to the staff on board. Holyhead to Dublin by Irish Ferries ship Ulysses costs £29 plus £16 supplement for access to the Martello Club lounge. Simply book the 09:10 Mondays-Saturdays train from London Euston to Holyhead online at www.virgintrains.co.uk, looking for a first class Advance fare. Booking normally opens 12 weeks ahead, book early for the best fares. If you only see the £237 Anytime full-price fare, it's possible that reservations haven't opened yet (as the Anytime fare isn't tied to a reservation, but Advance fares are). Then book the daily 14:10 ferry from Holyhead to Dublin and/or the 08:05 ferry from Dublin to Holyhead at www.irishferries.com. Make sure you add a seat in the Martello Club lounge or indeed a private cabin to your booking when prompted. Feedback if you travel this way is always appreciated! 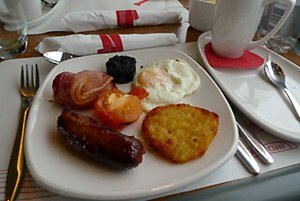 Travel on Mondays-Fridays: First class on a direct Virgin Trains service between London and Holyhead includes complimentary meals, snacks & drinks on Mondays-Fridays, according to time of day. 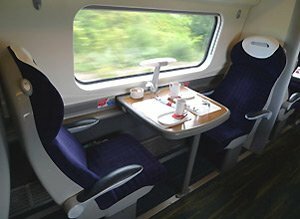 At weekends there is no cooked food, only a pre-packed breakfast box and complimentary tea & coffee, so make sure you travel on a weekday for the full benefit of first class. Take a direct London-Holyhead train: The direct trains between London and Holyhead are operated by Virgin Trains so have first class complimentary at-seat food and drink service for the whole journey. If you travel between London & Holyhead with a change of trains at (say) Crewe, the train between London and Crewe will be Virgin Trains with complimentary food & drink, but the train between Crewe and Holyhead will be Arriva Trains Wales who do not provide complimentary food or drink. So take a direct London-Holyhead or Holyhead-London train to get the full benefit of first class. Which is why I don't mention Sundays from London to Holyhead & Dublin in this section, even though you can travel on Sundays. In the Dublin to London direction, use an all-weather-reliable ship rather than the Swift fast ferry. The Swift is cancelled if wave height exceeds 1 metre, and an advance-purchase ticket is only valid on the specific train you book from Holyhead, so you don't want to miss the train. A first class table for two on Virgin Trains. Book a first class ticket to Holyhead on the 09:10 at www.virgintrains.co.uk. 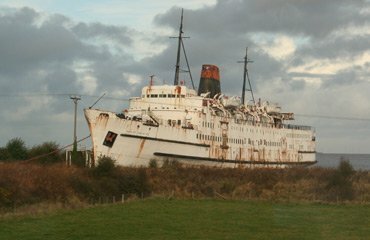 There is a regular fully-integrated train & ferry service from London, Bristol & Cardiff to Rosslare in Southern Ireland via Fishguard. Rosslare is handy for Wexford & Waterford. Combined train & ferry SailRail tickets are sold from any British railway station to Rosslare Europort via this route, just use the journey planner at www.loco2.com to buy a ticket to Rosslare Europort or any Irish station (it can help to click More options and put Fishguard Harbour in the via box). If you're heading for Cork, Limerick and so on, you're better off travelling via Holyhead & Dublin, see here. London-Dublin journeys are best made via Holyhead, see here. Trains between London & Fishguard are not direct, you change at at Newport, Cardiff or Swansea - the booking system will tell you where, as it varies. * = by bus, not train. SailRail tickets not valid, separate ticket needed for the bus. ** = There was an 18:35 Rosslare to Dublin, then it was 17:55 so missed the ferry connection. Irish rail keep changing their minds, check yourself at www.irishrail.ie. No service on 25 & 26 December. Always check UK train times for your date of travel at www.nationalrail.co.uk, as engineering work can affect train times especially at weekends. Rosslare Europort is linked by train to Wexford, Wicklow & Dublin. They've rather stupidly moved the platform away from the ferry terminal, and it's now a 5 minute walk from the terminal building. Check Irish train times at www.irishrail.ie. Rosslare to Wexford & Dublin buses are operated by Bus Éireann, check times & fares at www.buseireann.ie. The Waterford connection: Sadly, the Rosslare-Waterford railway was closed in September 2010, and is now the missing link in the Irish rail network. You unfortunately now need to travel by bus. Arriving at Rosslare Europort on the afternoon ferry, a bus leaves from outside Rosslare ferry terminal doors at 19:00 daily, arriving Waterford 20:20. Arriving at Rosslare on the overnight ferry, a bus leaves from outside Rosslare ferry terminal doors at 07:00 on Mondays-Saturdays or 07:15 on Sundays, arriving at Waterford bus station at 08:45. In the other direction, a bus leaves Waterford bus station at 07:00 daily, arriving Rosslare Europort ferry terminal at 08:25, in time for the 09:00 ferry. In the evening, a bus leaves Waterford bus station at 17:30 Mondays-Saturdays arriving Rosslare Europort ferry terminal at 19:10, or 16:30 on Sundays, change at Wexford, arriving Rosslare 18:20, in good time for the 21:00 ferry. Please check these bus times at www.buseireann.ie. Check the fare from any British station to Rosslare Europort using www.loco2.com. Advance fare = Sail Rail Advance = the fare you would normally want to buy. Tickets must be booked by 18:00 the day before you travel. The fares shown above are not 'starting at...' prices, but are fixed prices that are almost always available at the price shown, even the day before departure. The ticket includes a reservation on the ferry and on any British trains on which seat reservation is possible. You can only travel on the specific train or trains which have been reserved for you, not on alternative trains or routes, unless a delayed ferry means you miss a scheduled connection. No stopovers allowed. On trains on which seat reservation is not possible, meaning local or suburban trains, you can take any suitable train. Tickets are non-refundable, but changes to date or time can be made for a fee (about £10) in person at British railway stations but not in Ireland or by phone. Single fare = Sail Rail Single = the fare you pay if you buy a ticket on the day of travel. Also known as Standby. A reservation is required on the ferry, but seat reservation on trains is optional and you can use any train and any permitted rail route to and from the ferry port. However, no stopovers are allowed except as necessary to make connections. You can buy a Single fare in advance if you like, but the only reason you'd want one is if you wanted the flexibility to take alternative trains or routes on the way to or from the ferry port from those that the system offers you. Refunds allowed less a £15-£20 admin fee. The fare includes the train to Fishguard and the ferry to Rosslare, all on one ticket for one inclusive price. If you book through to Wexford or Dublin or any other Irish station, it also includes the Irish train. SailRail tickets do not cover buses, so if you want to use a bus, for example the Rosslare-Waterford bus, book a SailRail ticket as far as Rosslare and buy a separate ticket for the bus when you get to Rosslare. The fares are fixed price, it's the same price whether you buy 90 days in advance or just one day ahead, summer or winter, mid-week or Fridays. These fares are not a limited availability offer, they are always available. However, the Single fare now applies if you buy a ticket on the day of travel. Just remember that in practice the rail industry reservation system has a quota of ferry places allocated to it, which can in theory sell out at busy times, so advance booking is a good idea. Return journey = two one-way fares. Railcard holders: There's no further discount for railcard holders, as they're so cheap anyway. Children 5 to 15 travel at 50% off these fares, under 5s free. Travelling beyond Rosslare? SailRail tickets to Irish stations beyond Rosslare were stopped, but were reinstated in 2013. So you can now book through from any British station via Rosslare to any Irish station. However, check your connection by train is possible, for example there's no train service between Rosslare and Waterford, only buses, and SailRail tickets aren't valid on buses. Taking a bicycle? Bikes go for £10 each way on Stena Line, no reservation required. Bikes are carried free on trains to Fishguard, but reservations are recommended as there's a 2 bike limit on Arriva Trains Wales and a 6 bike limit on First Great Western. Call First Great Western to book your bike on the train. Buy online at www.loco2.com. Simply book from any British starting station you like to Rosslare Europort. This will book combined train & ferry tickets from London or any other station in Britain to Rosslare harbour, no booking fees, no card fees. Onward tickets from Rosslare to Wexford, Waterford etc. should be bought on board the bus or train when you get to Rosslare. Buy in person at most UK railway stations. Buy tickets by phone, calling the SailRail booking line 0870 9 000 773 (+44 870 9 000 773 from outside the UK). Lines are open 08:00-20:00 Mondays-Fridays, 09:00-17:00 Saturdays & Sundays. You can also book by calling Stena Line on 08445 762 762. Lines are open 08:30-20:00 Mondays-Fridays, 09:00-18:00 Saturdays & 09:00-17:00 on Sundays. Onward tickets from Rosslare to Wexford, Waterford, Wicklow or Dublin can be bought when you arrive at Rosslare. Rosslare station has no ticket office, but has a ticket machine. 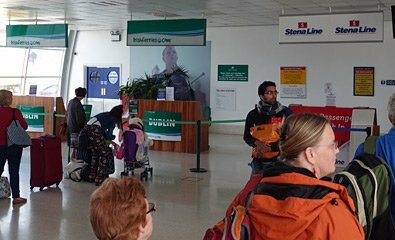 If you're in Ireland, you can buy train+ferry tickets by calling (01) 703 1884 (lines open 09:00-17:00 Monday-Friday) or by visiting a major Irish Rail station. 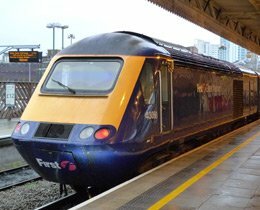 Take a 125mph high-speed train from London Paddington station to Cardiff. There's a buffet-bar on board. You'll pass the Uffington White Horse and travel through Isambard Kingdom Brunel's Severn Railway Tunnel into South Wales. 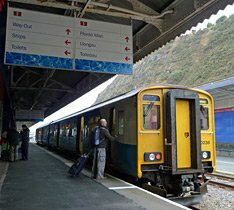 ...Transfer to a local train for the last leg to Fishguard Harbour. A refreshment trolley is available. At Fishguard, the little 2-car train arrives right alongside the Stena Line ferry Stena Europe for Rosslare. It couldn't be simpler. 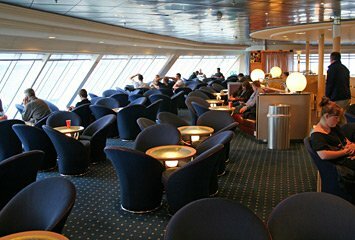 The ferry has bars, restaurants, lounges & family areas, also private cabins. All short breaks from the UK to Ireland involve flights, don't they? No they don't! Back in 2008 Railtours Ireland started running short breaks to Ireland using eco-friendly train & ferry to Dublin, with the option to add one-day tours to kiss the Blarney Stone, the Ring of Kerry, or visiting the Giant's causeway out of your Dublin base. No airport hassles, no ugly motorways. They've now been joined by train holiday specialist Railbookers who have also started offering short breaks to Dublin by train & ferry. Both companies come highly recommended. Railbookers (www.railbookers.co.uk) can tailor-make a 2-night or 3-night short break from anywhere in Britain to Dublin for you, starting on virtually any day or date you like, with train and ferry travel from anywhere in Britain to Dublin then 2 or 3 nights in the 4-star Ashling Hotel in Dublin. See www.railbookers.co.uk or call 020 3327 0761. Railtours Ireland (www.railtoursireland.com) run a tour leave London every weekday from March to October, using the 09:10 Virgin Trains departure direct from London Euston station to Holyhead via the scenic North Wales coastline. At Holyhead you board the Irish Ferries cruise ferry Ulysses and sail across the Irish Sea to Dublin Ferryport, arriving at 5.25pm, just as I recommend above. It's the scenic & painless way to reach Ireland! See the account of this journey & photos. 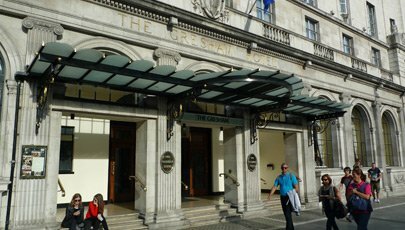 The break combines London-Dublin return train+ferry travel plus 2 nights three-star hotel accommodation in Dublin (with the option of extra nights). You can then mix-&-match the London-Dublin tour with one or more 1-day tours from Dublin, see the day trips section above. To book from the UK, call Railtours Ireland free on 0800 328 2899. To book from outside the UK, call +353 1 856 0045. Book a SailRail ticket to Dublin as shown above. 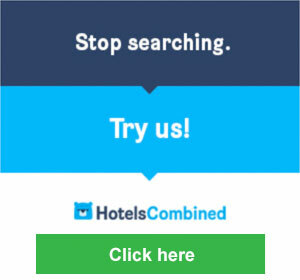 Add a hotel in Dublin using the hotel search system below.